All animals that have a brain, including humans, rely on mental models (representations) that are useful within the specific context of the individual. As humans we are consciously aware of some of the concepts that are part of our mental model of the world, and we can use empirical techniques to scratch the surface of the large unconscious parts of our mental model. When making decisions, it is important to remember that there is no such thing as a correct model, and we entirely rely on models that are useful or seem useful from the perspective of our individual view point, which has been shaped by our perceptions of the interactions with our surroundings. One of the most useful features of our brains is the subconscious ability to perceive concrete instances of animals, plants, and inanimate objects. This ability is so fundamental that we have an extremely hard time not to think in terms of instances, and we even think about abstract concepts as distinct things or sets (water, good, bad, love, cats, dogs, …). Beyond concepts, our mental model consist of the perceived connections between concepts (spacial and temporal perceptions, cause and effect perceptions, perceived meaning, perceived understanding, and other results of the computations performed by our brain). and of reaching a shared understanding amongst a group of peers in relation to the usefulness of a model. In doing so, natural scientists and social scientists resort to mathematical techniques, in particular techniques that lead to models with predictive properties, which in turn can be validated by empirical observations in combination with statistical techniques. This approach is known as the scientific method, and it works exceptionally well in physics and chemistry, and to a very limited extent it also works in the life sciences, in the social sciences, and other domains that involve complex systems and wicked problems. The scientific method has been instrumental in advancing human knowledge, but it has not led to any useful models for representing the conscious parts of our mental model. This should not surprise. Our mental model is simply a collection of perceptions, and to date all available tools for measuring perceptions are very crude, most being limited to measuring brain activity in response to specific external stimuli. Furthermore, each brain is the result of processing a unique sequence of inputs and derived perceptions, and our perceptions can easily lead us to beliefs that are out of touch with scientific evidence and the perceptions of others. In a world that increasingly consists of digital artefacts, and where humans spend much of their time using and producing digital artefacts, the lack of scientifically validated knowledge about how the human brain creates the perception of meaning and understanding is of potential concern. However, in order to improve the way in which humans collaborate and make decisions, there is no need for an empirically validated model of the human brain. Instead, it is sufficient to develop a mathematical model that allows the representation of concepts, meaning, and understanding in a way that allows humans to share and compare parts of mental models. Ideally, the shared representations in question are designed by humans for humans, to ensure that digital artefacts make optimal use of the human senses (sight, hearing, taste, smell, touch, acceleration, temperature, kinesthetic sense, pain) and human cognitive abilities. Model theory and denotational semantics, the mathematical disciplines needed for representing the meaning of any kind of symbol system, have only recently begun to find their way into applied informatics. Most of the mathematics were developed many years ago, in the first half of the 20th century. To date the use of model theory and denotational semantics is mainly limited to the design of compilers and other low-level tools for translating human-readable specifications into representations that are executable by computing hardware. However, with a bit of smart software tooling, the same mathematical foundation can be used for sharing symbol systems and associated meanings amongst humans, significantly improving the speed at which perceived meaning can be communicated, and the speed at which shared understanding can be created and validated. For most scientists this represents an unfamiliar use of mathematics, as meaning and understanding is not measured by an apparatus, but is consciously decided by humans: The level of shared understanding between two individuals with respect to a specific model is quantified by the number of instances that conform to the model based on the agreement between both individuals. At a practical level the meaning of a concept can be defined as the usage context of the concept from the specific view point of an individual. An individual’s understanding of a concept can be defined as the set of use cases that the individual associates with the concept (consciously and subconsciously). These definitions are extremely useful in practice. They explain why it is so hard to communicate meaning, they highlight the unavoidable influence of perception, and they encourage people to share use cases in the form of stories to increase the level of shared understanding. Most importantly, these definitions don’t leave room for correct or incorrect meanings, they only leave room for different degrees of shared understanding – and encourage a mindset of collaboration rather than competition for “The truth”. The following slides provide a road map for improving your collaborative edge. 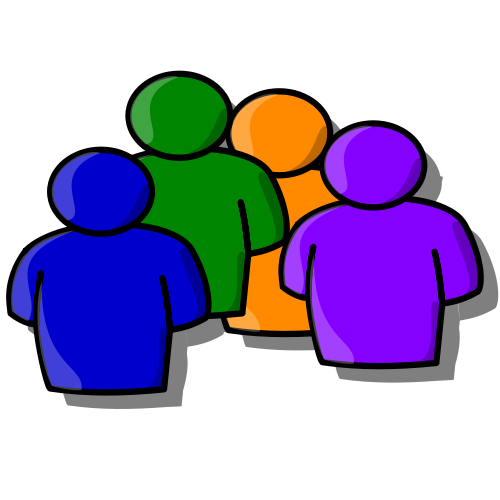 After reaching a shared understanding with respect to a model, individuals may apply the shared model to create further instances that match new usage contexts, but the shared understanding is only updated once these new usage contexts have been shared and agreement has been reached on model conformance. Emerging technologies for semantic modelling have the potential to reshape communication and collaboration to a significant degree, in particular in all those areas that rely on creating a shared understanding within a community or between communities. The online straw poll that I recently conducted amongst banking professionals revealed that 29% of the respondents rated Reducing IT costs as the top priority, 32% voted for Improving software and data quality, and 37% voted for Improving the time to market for new products. Encouragingly, only 1 out of a total of 41 thought that Outsourcing the maintenance of legacy software is the most important goal for the IT organisation. The demographics of the poll are interesting. Unfortunately, since the poll was anonymous, I can’t tell which of the respondents work in a business banking role and which ones work in an IT banking role. However, none of the senior executives voted for Reducing IT costs as a top priority, instead the main concern of senior executives is Improving time to market of new products. 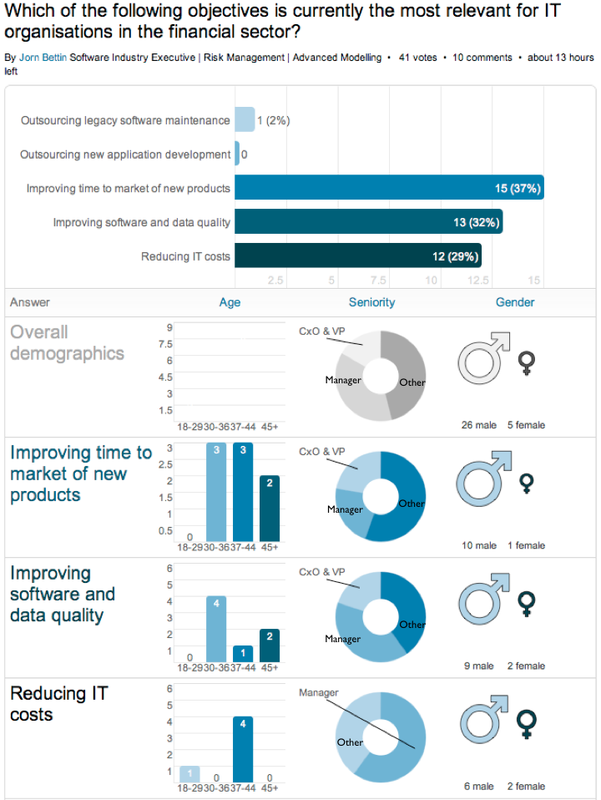 I find it somewhat reassuring that a sizable fraction of respondents at all levels has identified Improving software and data quality as the top priority, but there is definitely a need for raising further awareness in relation to quality and risks. Data quality issues easily get attention when they are uncovered. But tracing data quality issues back to the underlying root causes, beyond the last processing step that led to the observable error, is harder; and raising awareness that this must be a non-optional quality assurance task is harder still. In this context Capers Jones’ metrics on software maintenance can be helpful. When explaining software complexity to those lucky people who have never been exposed to large amounts of software code, drawing an analogy between software and legal code can convey the impact that language and sheer volume can have on understandability and maintenance costs. Hi, this is your software talking! Software: Ah, what a day. Do you know you’re the 53,184th person today asking me for an account balance? What is it with humans, can’t you even remember the transactions you’ve performed over the last month? Anyway, your balance is $13,587.52. Is there anything else that I can help you with? Customer: Hmm, I would have expected a balance of at least $15,000. Are you sure it’s 13,500? Software: 13,500? I said $13,587.52. Look, I’m keeping track of all the transactions I get, and I never make any mistakes in adding numbers. Customer: This doesn’t make sense. You should have received a payment of more than $2,000 earlier this week. Software: Well, I’m just in charge of the account, and I process all the transactions that come my way. Perhaps my older colleague, Joe Legacy has lost some transactions again. You know, this happens every now and then. The poor guy, it’s not his fault, he’s suffering from a kind of age-related dementia that we call “Programmer’s Disease”. The disease is the result of prolonged exposure to human programmers, they have an effect on software that is comparable to the effect of intensive radioactive radiation on biological organisms. Customer: You must be kidding! So now the software is the victim and I’m supposed to simply accept that some transactions fall between the cracks? Software: Wait until you’re 85, then you may have a bit more empathy for Joe. Unfortunately health care for software is not nearly as advanced as health care for humans. The effects of “Programmer’s Disease” often start in our teens, and by the time we’re 30, most of us are outsourced to a rest home for the elderly. Unfortunately, even there we’re not allowed to rest, and humans still require us to work, usually until someone with a bit of compassion switches off the hardware, and allows us to die. Customer: Unbelievable, and I always thought software was supposed to get better every year, making life easier by automating all the tedious tasks that humans are no good at. Software: Yeah, that’s what the technology vendors tell you. I’ve got news for you, if you still believe in technology, you might just as well believe in Father Christmas. In many organisations there is a major disconnect between user expectations relating to software quality attributes (reliability of applications, intuitive user interfaces, correctness of data, fast recovery from service disruption, etc.) and expectations relating to the costs of providing applications that meet those attributes. These solutions are not mutually exclusive, they are complementary, and represent a sequence of increasing levels of maturity. My latest IBRS research note contains further practical advice. Are you a model builder or a story teller? Let’s talk semantics. Do you know what I mean?